A killer burglar who broke a pensioner's ribs and tore the skin from his hand has been jailed for at least 33 years. Jason Wilsher, 20, from Leicestershire, also punched 87-year-old Arthur Gumbley in the face during the break-in in 2017. Mr Gumbley died from his injuries three weeks after the attack in his home in Little Aston. Wilsher was jailed for life for murder at Stafford Crown Court. He will serve a minimum of 33 years and was also given a concurrent sentence of 16 years for conspiracy to commit robbery. Mr Gumbley was "beaten black and blue" after approaching his killer "in a friendly way" and asking why he was inside his home. Staffordshire Police described the November 2017 attack as "horrific and unnecessary". Sentencing, Judge Michael Chambers QC said: "To target the elderly is truly wicked. This was the senseless murder of an 87-year-old man." Mr Gumbley's son, Michael, said: "There's not a day goes by where I don't think about how my dad died. "I don't understand why another human being would want to kick or punch an elderly pensioner." Daughter Sandra Bromley added: "Every night I go to ring him but the only way I can hear his voice now is on a tape from his hospital bed." Daughter Susan Boyes said the attack had made her an "emotional wreck" and makes her "cry every night". The court heard Wilsher, of Barlestone Road, Bagworth, and another intruder raided the home in Endwood Drive, on the border of Lichfield and Sutton Coldfield, and stole a watch and jewellery. 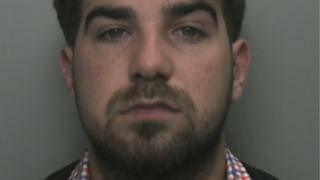 Mr Gumbley was punched, kicked and had the skin torn from his hand as a watch was pulled from his wrist. Wilsher's criminal history was detailed by the judge and included a similar attack on an 86-year-old man in his home.